Posted by Dustin Miller on April 2, 2013. Building on the bulk editing tools Google introduced last November, the search company rolled out a new keyword bulk editing feature on April 1st. This feature is designed to make it easier to add, edit and remove a large amount of keywords at once. 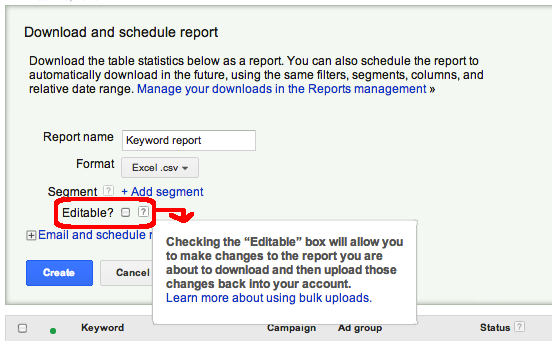 Selecting the “Editable” box will prompt the Google AdWords system to download an editable version of the keyword performance report. Once downloaded, you can edit the report and prepare it to upload your changes. In the report, you will see an “Action” column, where you will specify whether you want to Add, Remove, or Set certain keywords. For existing keywords, you can modify the keyword state, max CPC and destination URL. Currently, you do not have the ability to change the keyword match type with this feature. Once you’re finished inputting all of your changes, go to Reports and uploads in the left-hand navigation bar and click the Uploads tab. Here, you can upload your keyword report by clicking “Create an editable report” on the right-hand side. Since any modifications that you upload can only be reversed manually, Google advises that you save a copy of your original download before making any changes.